How many times have you wished for more time or an extra day to accomplish something? Today is your day! You get that extra 24 hours that you have been seeking to finish errands, achieve a goal, gain some extra sleep or work a bit more on that project. It is a full bonus day on the calendar, but in reality, is the point in time we have opted to play catch up for the drift in alignment between the lunar cycles and the calendar. Without the additional day, we would lose almost six hours every year, meaning that every century the calendar would be out of sync with the lunar calendar by almost a month (24 days). So Leap Year is really yet another example of how little things add up to make a big difference. The Earth’s rotation of the sun takes 365 days, 5 hours, 48 minutes and 45 seconds — we just “ignore” those extra 5:48:45 until today. Whether you propose, buy gloves, relax or work extra hard, I hope you make note of the bonus day. Use it to take a leap of faith to do something new or something that you have been putting off. If it’s worth adding an extra day to realign the calendar, it’s worth doing something special with it. Star Wars: The Force Awakens is the highest grossing motion picture of all time. It has grossed over $2 billion worldwide, and done so in less than two months of release. Clearly, it is a monumental blockbuster and box office hit. Yet tonight, at the 88th annual Academy Awards, the movie won’t be named Best Picture. It isn’t even nominated. The Force Awakens only received five nominations, and all in technical categories: film editing, original score, visual effects, sound editing and sound mixing. Several of the Best Picture nominees many people won’t have even heard of, let alone seen, until the contenders were released. Room, Brooklyn and Spotlight together haven’t grossed $100 million domestically vs. The Force Awakens’ $916 million alone. Which brings me to the question of “best”. Who defines best? Clearly there are criteria to win certain awards and honors, but “best” is a personal and subjective term. There are always other measures and values to weigh, and different ways of evaluating what means the most to an individual. Don’t let others, not even the Academy, define what best means for you. I recently played the game at Staples of trying to figure out which was the best price for copy paper. Is it cheaper to buy five reams and receive a rebate in a month for four of them? Am I better off buying one ream for one cent and the rest at full price? Will I ever use three full cases so I should buy two and get a whole case free? It is worse than BOGO. But all this time spent pondering paper choices got me to questioning why paper is the size that it is. Think about it: 8-1/2 by 11 is an odd size to be the standard. So I turned to trusty Wikipedia and read something that I don’t read very often: “the precise origins of the dimensions of US letter size paper are not known.” The guess is that they came about because they were “a quarter of the average maximum stretch of an experienced vatman’s arms” in the days of manual paper making. Now there’s a precise measure! Ronald Reagan contributed to the standardization by making the 8-1/2 x 11 the official paper size for all US government forms, and now it is the defined standard per the American National Standards Institute. Thank goodness, because think of what expense and chaos it would cause if printers, binders, form processors and copy paper came in different sizes. Thanks to Curt for asking! The higher you ascend on the organizational ladder, the fewer people there are who tell you that things are good. Most of what makes its way to your desk are the problems and challenges. You don’t get many kudos or appreciation. And if you need that external validation, a senior leadership position is probably not the right fit for you. To be comfortable long term, you need to be internally motivated and able to take satisfaction in a ‘good job done’ without someone else complimenting you on it. Think about where you fit on the internal/external motivation spectrum. Does it align with your position on the leadership ladder? According to the Humane Society, 62% of U.S. households own pets. That represents a lot of fur, a lot of love, and a huge financial market. 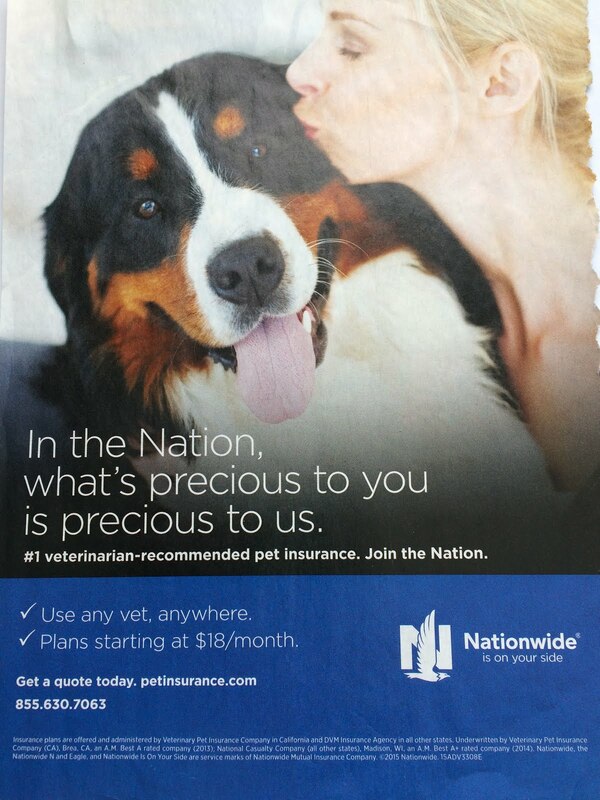 Nationwide Insurance is moving to capitalize on this devotion by promoting its pet insurance. Such a product has always been available, but Nationwide is attempting to make it commonplace, by promoting it with emotional full page ads in mainstream magazines and expanding the coverage available. Anyone who has a pet knows that the costs can be steep, even for a healthy pet. I wrote yesterday about the birth to death model of veterinarian care, but it doesn’t come cheaply. More pet owners are faced with losing a “member of the family” or investing thousands of dollars in extended treatments, and Nationwide sees an opportunity in this dilemma. There are many financial safeguards that have become common place that were not thought of before. AppleCare and insurance plans for electronics. Extended warranties on appliances or cars. Supplemental disability insurance and credit overdraft protection. Why not pet protection too? Think about where there is a gap in what currently exists and what could be. How can you build a bridge to cross that gap, and let it lead you to the pot at the end of the rainbow. Think about the difference between a vet and a physician. Both are doctors who have completed rigorous medical training, but then the paths diverge. Vets are mostly generalists who treat animals from birth (or close to it) through death. There are few animal specialists, and mostly people go to their same neighborhood vet for every malady, surgery, routine care and even end of life assistance. Vets dispense prescriptions, trim nails, take x-rays, sell food and serve as a one-stop shop for total small animal care. They deal with dogs, cats, birds, iguanas, gerbils and other different species — all with varying anatomy and needs. Contrast that with a physician, who primarily deals with one age group, one system of the body, and relies on countless other professionals to assist with providing care. Doctors of humans are mostly specialists who focus in depth on one aspect of treatment and health. The medical system is engulfed in paperwork and insurance, whereas for most vets it is all cash on the spot. Both serve their purposes, and, of course, humans are far more valuable and complex than the family pet, but the contrast between vets and physicians provides an informative analogy for how work is done. Which are you: a generalist or a specialist? Do you go deep in a specific area or know a little about a wider range of material? Can you become more like a vet — or more like a physician — and adopt some of the strengths of each model? I’m glad there is a generalist for my dog and a specialist for me. Think about how you can align your work so you’re not barking up the wrong tree. As I said in my presentation, this philosophy has been on my desk literally for my entire career and shaped the way I do my work. I have mentally adapted the tenants to apply to “staff” and “people”, not just students, and it has always served me well. Several people have asked for a copy of the complete quotation. I am happy to provide it below. 1. Know as many students as you possibly can and know them well. Nothing is done without this individual relationship. 2. Be honest with yourself and others. It does no good to tell students what you think they want to hear. 3. Realize that your position is at best nondescript. No job description or cookbook will ever substitute for your native intelligence and the qualities which have led to your selection for this job. 4. Be available. There is no such thing as a “standard work day.” The job is time consuming and restrictive, but rewarding. 5. Deal with the important and relevant aspects of your position. Avoid getting burned out in dealing with petty differences. 6. Recognize that the values and attitudes you take to your position, will, to a great extent, determine the way many students react to us all. 7. Understand that you work more by persuasion and the power of your personality than any amount of formal authority. 8. Treat each student with the dignity and respect that you want for yourself. 9. Accept the fact that we are not an end to ourselves. With each new program and student, we should work toward the end of eliminating our necessity. 10. Finally, never underestimate the power of your influence on a student. Your conduct and conversation are what you are — a model for others.